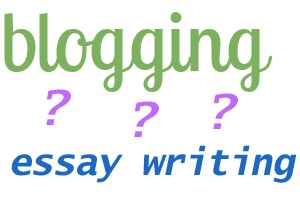 How Is Blogging Different From Essay Writing? Many essay writers are used to look down on blogging, thinking the quality of blog content cannot be compared with the high-brow language of essay writing. It’s true that blogging is a fundamentally different kind of writing. It doesn’t have the many qualities one would find in a beautifully written essay. However, there is no need to find differences and similarities between the two. Essay writing and blogging can successfully coexist and make each other better. Professional essay writers know every tip and secret of making their essays truly shine. They know how to open their essay with a gripping paragraph that both tells the readers what they’ll see in the subsequent paragraphs and leaves a little mystery of the content of the essay. Their arguments are comprehensive and well-written, making it hard for the reader to disagree with them. They use metaphors and other stylistic devices to make their writing stand out and become memorable for the readers. They can revise the same sentence over and over until it looks perfect in their eyes. They know that thousands will be reading their essay and they don’t want a single letter of their writing to be sloppy or unconvincing. Professional blogging is a completely different story. In the mind of a typical reader, a blog post can provide information that is useful or at least interesting to read, but blogging is rarely associated with literary excellence. Few bloggers think about the methods they’re using to convey their message, and it’s not to say they are not succeeding – even with all their flaws, blogs are a viable source of information on every topic imaginable and clearly a force to be reckoned with. Nevertheless, blogging and essay writing are two types of writing that rarely meet. It’s not uncommon for essay writers to go through periods when they can’t produce a single letter on the quality level they’re used to. There are many reasons why it can happen: a writer can encounter a writer’s block or temporarily lose faith in their abilities as a writer. If you’re only writing as a hobby or a side job, these periods of non-writing won’t have too much of a negative effect on your career. However, if your income depends on your writing, spending even one day where you haven’t written even one letter can have a damaging impact on your career and financial well-being. That is why more and more professional essay writers are turning to blogging. Without the super strict quality requirements, blogging removes the pressure component from writing. As a blogger, you can write about whatever you are passionate about and be sure that your piece will be a success with the audience. A wider audience means more fans of your work, and having that kind of support helps you build up confidence required to do essay writing. Plus, blogging on a daily basis helps you be more organized. Knowing that thousands of people are looking forward to reading your next piece is very stimulating, as every writer will concur. With more authors successfully mastering both essay and blog formats, there is no reason for you not to do the same and welcome blogging into your life. Many essay writers are used to looking down on blogging, thinking the quality of blog content can't be compared with the high-brow language of essay writing.